Scholar, African traditionalist poet, and Senegal’s first president, Léopold Sédar Senghor was born on October 9, 1906 in Joal, Senegal. His father, Basie Diogoye Senghor, was a Malinké landowner. His mother, Gnilane Bakhoum, came from a Christian Fulani family. They gave Senghor a European name to reflect both the noble Serer culture they identified with, as well as their Catholic faith. Senghor grew up with his father’s four wives and his twenty-four siblings. At the age of seven, Senghor was sent to a Catholic mission school, where he first learned French. At 13, he decided to enter the Catholic priesthood. He attended Libermann seminary in Dakar but in 1926, dissuaded by the seminary, switched to the secondary school Lycée Van Vollenhoven. He graduated from high school with honors and his classical languages teacher persuaded the colonial administration to grant Senghor a scholarship to pursue literary studies in France. After arriving in Paris in 1928, he enrolled in Lycée Louis-le-Grand. There he met some of his closest friends, including George Pompidou, future president of France, and Aimé Césaire, fellow poet and intellectual. After becoming a French citizen, Senghor completed his military duties. He was drafted during World War II into the 3rd Regiment of the Colonial Infantry, where he fought against the Germans at La Charité-sur-Loire. He was taken prisoner in 1940 and spent two years in a camp, where he wrote his poems for Hosties Noire (Black Hosts, 1948). Before the war, Senghor worked to create an ideological framework that would encompass his French-ness and his African-ness. As time progressed he increasingly became more attached to his African traditions and less interested in assimilation. These ideas, along with the ideas of Aimé Césaire and other black intellectuals in France, would turn into the Negritude movement. In 1948 French philosopher Jean-Paul Sartre wrote a preface to Senghor’s first major publication, The Anthology of New Black and Malagasy Poetry in the French language preceded by Black Orpheus by Jean Paul-Sartre, 1948. After World War II, Senghor added a political element to his literary career. He returned to Senegal to run for a seat in the French parliament. Senghor’s political agenda emphasized civil rights for the residents of French colonies rather than political independence. He urged a federation that would link Africa and Europe as equal partners. Unfortunately for Senghor, European politicians were not interested in raising African incomes and, likewise, African nationalists did not want to envision a “Eurafrica.” The wave of independence for African colonies hit Senegal and in 1960 Senegal became an independent nation. In September of 1960, Senghor was elected the first president of independent Senegal. As president, Senghor developed his approach to African socialism, which refused to reject capitalism entirely. He brought a stable economy to his country and France favored his efforts at developments. After twenty years in office, Senghor resigned from the presidency in 1981, giving the seat to Prime Minister Abdou Diouf. In 1983, Senghor became the first black person accepted into the Académie française. After his resignation from the presidency, he spent his time living in Dakar, Normandy, and Paris. 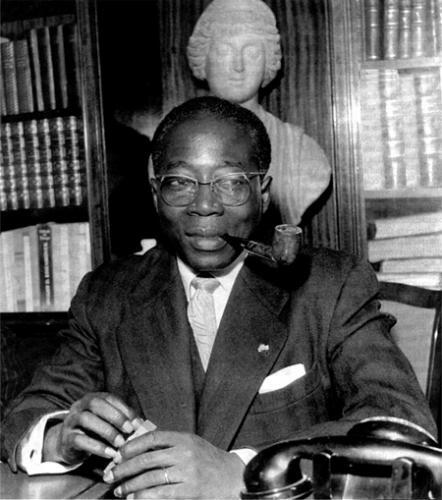 Léopold Sédar Senghor died in France on December 20, 2001. Melvin Dixon, Léopold Sédar Senghor: The Collected Poetry, Trans. by Melvin Dixon (Charlottesville: University Press of Virginia, 1991); Kevin Shillington, ed., Encyclopedia of African History (New York: Fitzroy Dearborn, 2005).